UNDER THE DIRECTION OF THE COMMITTEE OF GENERAL LITERATURE AND EDUCATION, APPOINTED BY THE SOCIETY FOR PROMOTING CHRISTIAN KNOWLEDGE (Price One Penny). The Nannau Oak which is here represented, had been for ages an object of superstitious dread to the peasantry of Merionethshire. On 13th July, 1813 it fell suddenly to the ground, completely worn out with age. 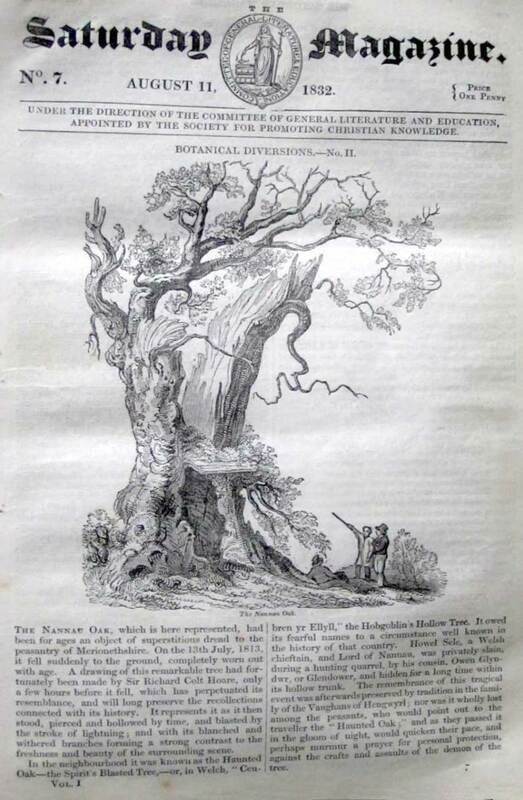 A drawing of this remarkable tree had fortunately been made by Sir Richard Colt Hoare, only a few hours before it fell, which has perpetuated its resemblance, and will long preserve the recollections connected with its history. It represents it as it then stood, pierced and hollowed by time, and blasted by the stroke of lightning; and with it’s blanched and withered branches forming a strong contrast to the freshness and beauty of the surrounding scene. In the neighbourhood it was known as the Haunted Oak–The Spirit’s Blasted Tree,–or in Welch, “Ceubren yr Ellyll,” the Hobgoblin’s Hollow Tree. It owed its fearful names to a circumstance well known in the history of that country. Howel Sele, a Welsh chieftain, and Lord of Nannau, was privately slain, during a hunting quarrel, by his cousin, Owen Glyndwr, or Glendower, and hidden for a long time within it’s hollow trunk. 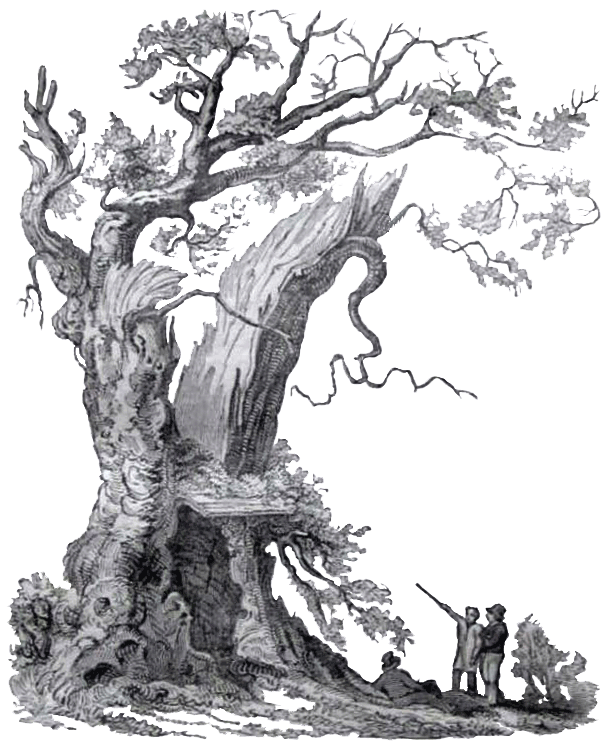 The remembrance of this tragical event was afterwards preserved by tradition in the family of the Vaughans of Hengwyrl; nor was it wholly lost among the peasants, who would point out to the traveller the “Haunted Oak;” and as they passed it in the gloom of the night, would quicken their pace, and perhaps murmur a prayer for personal protection, against the crufts and assaults of the demon of the tree.